"Workers rights are human rights! Union rights are civil rights!" 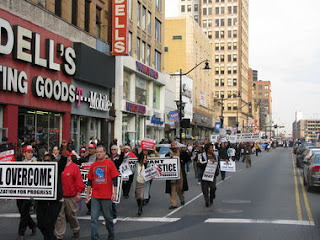 Reflecting on Monday's successful march and rally for Jobs, Peace, Equality & Justice (see Black NJ: POP remembers King by Uniting Labor & Community Forces) Lawrence Hamm, NJ state chairman of the People's Organization for Progress, noted, "this march was clearly smaller than the massive 2007 Peace & Justice Coalition event, but it certainly felt bigger, more significant…"
Larry went on to observe that the coalition of forces supporting and participating in the April 4th March & Rally for Jobs, Peace, Equality & Justice included a broader range of unions than came out in 2007. The AFL-CIO together the National NAACP issued a call for "We Are One" rallies across the country for April 4, 2011 to show solidarity with the state workers under attack in Wisconsin. 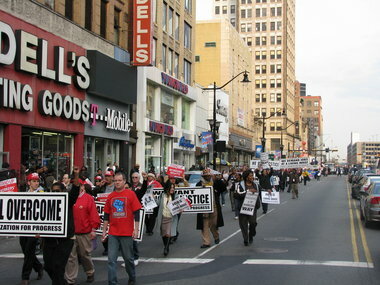 In Newark, NJ, Raleigh, NC and around the country labor and union leaders wisely united with existing events. 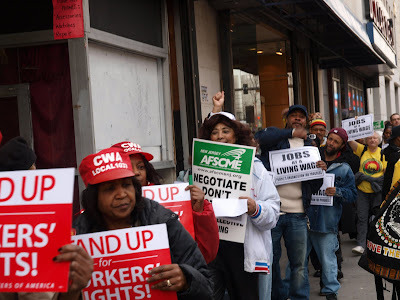 This included POP's April 4th rally, events of our sister organization, Black Workers for Justice, in Raleigh-Durham and many many other gatherings (click here to see photos from Raleigh). This important development represents an acknowledgement of the intersection of labor struggle and community struggle, or as Larry Hamm put it, "Our unions fight for us while we're on the job. We get home in the evening and we are the community! We need community-based organizations to continue the struggle. These are natural allies, we must unite the two fronts of battle." 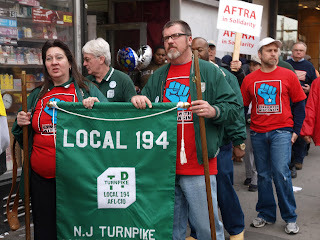 Thanks to Ajamu of BWfJ in North Carolina, Jon of POP and Tom Dinges at the Star Ledger for photos (Click here to view more photos from the POP March & Rally in Newark).